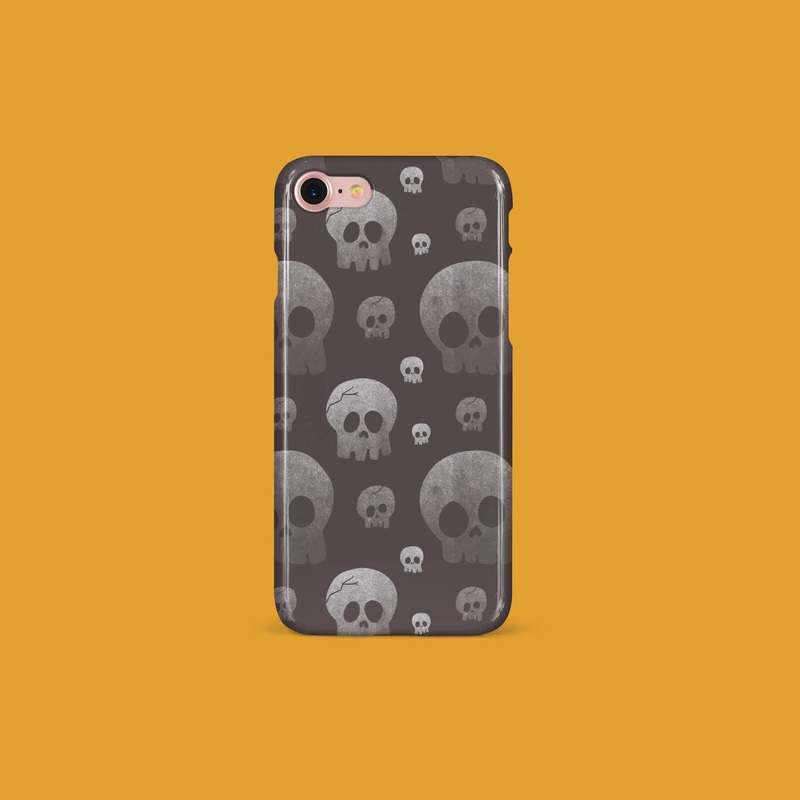 Since launching my very first phone cases I've been questioned for design tips & tricks by fellow aspiring designers (well I guess I better start calling myself an actual professional now!!) who also want to turn their ideas into beautiful products but don't quite know how. 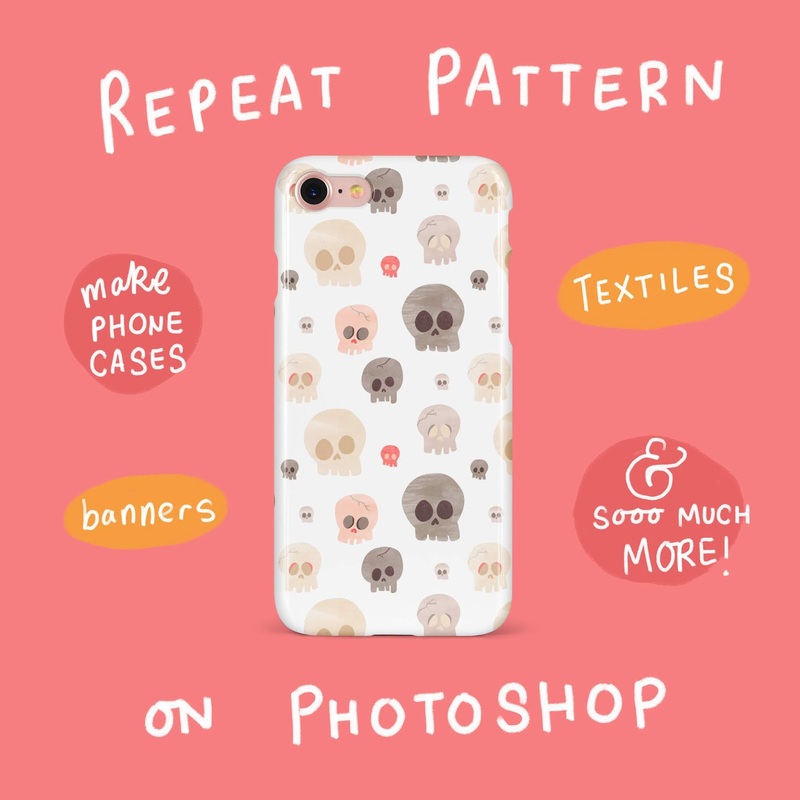 Once you have a repeat pattern, you can paste it into any product template and send it off to print. 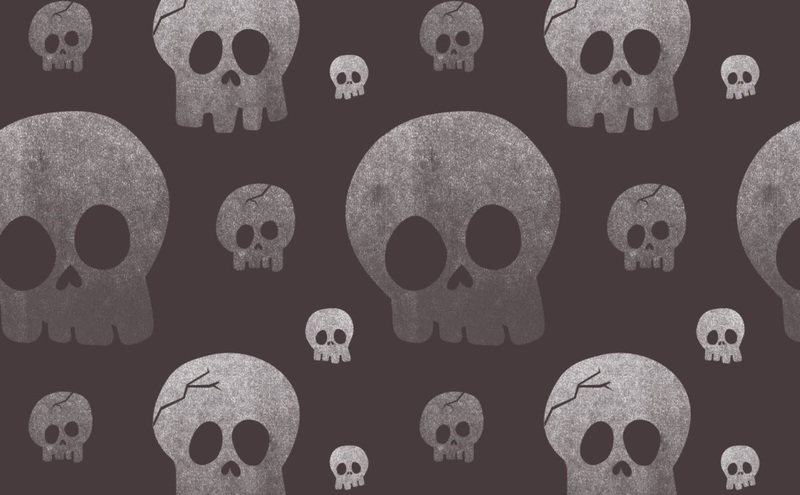 I've actually always made my existing products' patterns organically (example from the archives), but wondered how on EARTH people could be bothered to do that for wallpaper or hundreds of meters of fabric. I now think back to that time I tried to make 3m of patterned Christmas wrapping paper by eye with copy & paste. Well *cough* it turns out designers do not do that. Queue one of the only days at uni I thought the £50k might be worth it. I'm honestly surprised how many college students still say they haven't been introduced to Photoshop & Illustrator (we'll be dealing with Photoshop in this tutorial so I'm afraid you need to at least have your 30 day free trial running!). But even then, I've found there is SO much you can do that you don't even know to ask how to do. You know? That's why I'm happy to start adding to my 'Design Tips' Instagram highlight. I would LOVE to see my favourite illustrators doing the same, because once you've left design school and you no longer have that community to learn from, what can you do but fester in your own techniques? WELL. You can seek out tutorials like this, and I also have another (very good) recommendation at the end of this post, so scroll on! I'm going to go step by step through how to create a repeat pattern with tips & considerations to keep in mind. I'll try to cover everything, but I'm speaking as a fairly competent Photoshop user so might miss out little details if you're new. Feel free to question anything that isn't clear! Above you can see different variations of essentially the same objects. Playing with scale, position and proximity will completely change the pattern. It's trial and error, you'll know by eye when it works! 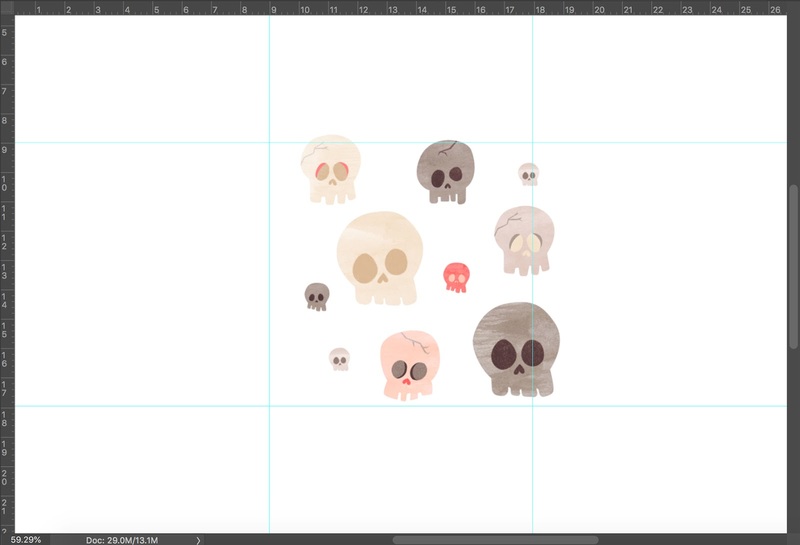 It's easiest if all your objects are on different layers and don't have a background. Create a new document. For products I go: 10cm x 10cm, CMYK, 300dpi. Drag the rulers (cmd+r) to each side of the page. 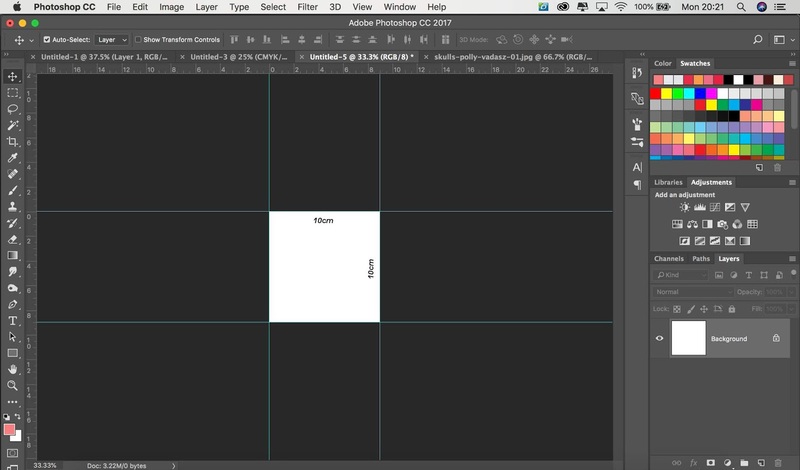 Now you want to create a bigger canvas, so go to Image -> Canvas size. Choose Percent in the drop down menu. Set it to 300% for both Width and Height. This will double the canvas on each side, so with the rulers it looks like you have 9 squares. Drag your objects into the document and keep them to one side. It's the middle square you're working on. Begin placing your objects in the kind of pattern you want. They should go over the ruler guides, which will help merge the pattern. Think about whether you want a scattered pattern or a lined up repeat. 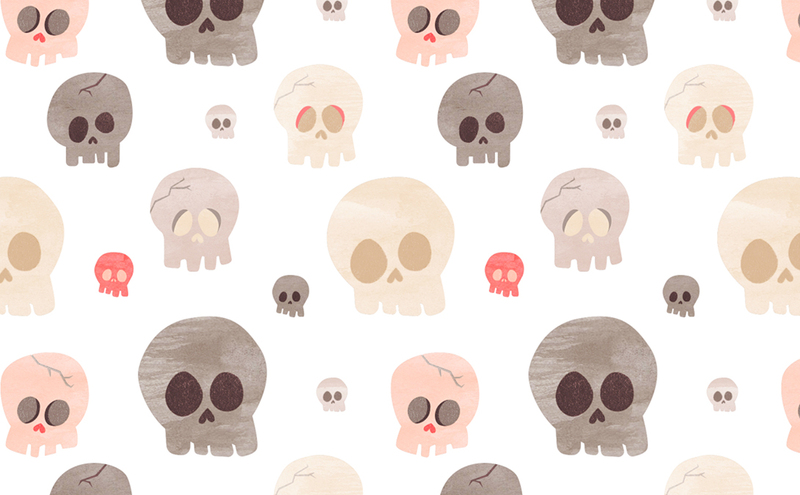 I like patterns which have a mix of scale - you can see above that there are different sized skulls. The mini ones help to fill gaps! It will take a few tries, but you need to leave room for the half of the object that's outside of the middle square to come back into the square on the opposite side. Hopefully the GIFs & diagrams below help to visualise this. The middle square is a puzzle piece. It has bits sticking out which lock into the squares either side. The difference is, every puzzle piece is exactly the same, so your puzzle can be infinitely big! 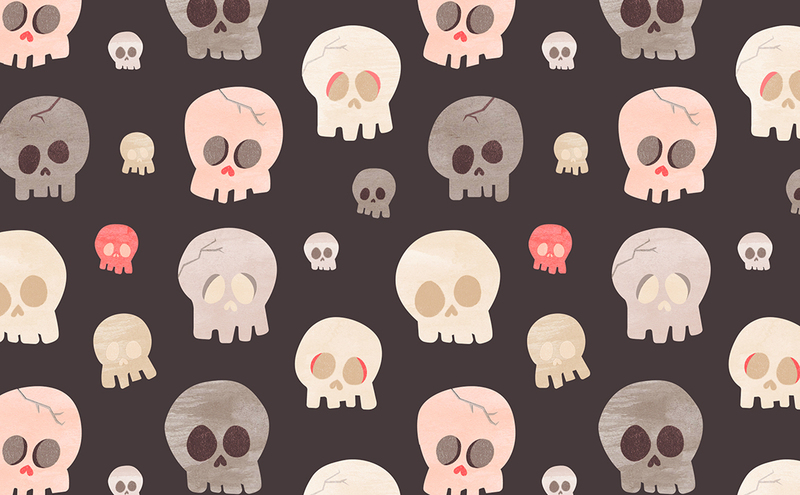 Select an object that's sticking out of the middle square (such as the grey bottom right skull). 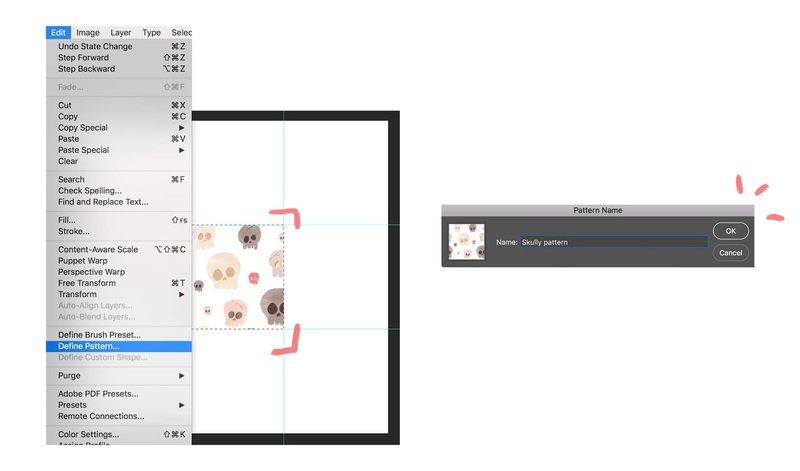 Using the Mask tool, select the area up until the ruler guide (which should snap into place). Using the Move tool, move the protruding section of the object over to the other side within the square. Holding the Shift key can help keep it exactly in place. It needs to line up perfectly with the other section. 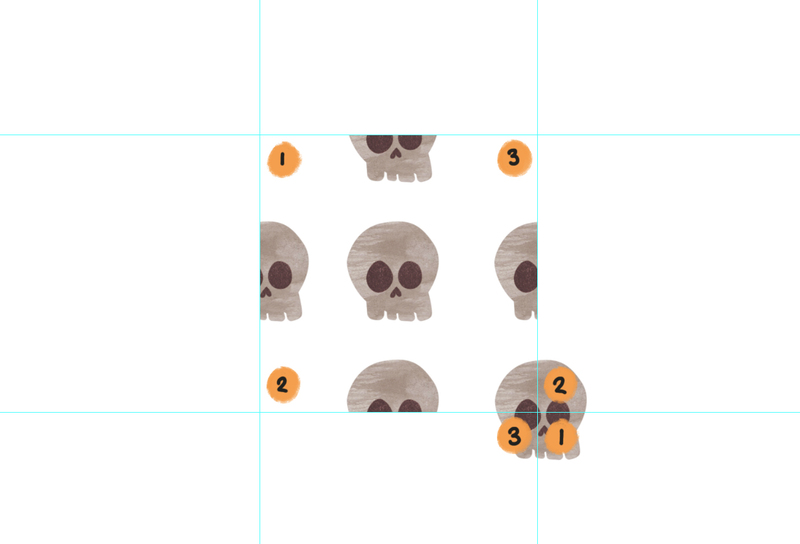 Do the same for each object on each four sides of the middle square. The four diagonal squares also need to be moved to the square diagonal to it. Now you have a puzzle piece, a brick, you want to see how it looks repeated. This step helps iron out any issues because it is a trial and error method! Now select the middle square using the Mask tool, then with the Moving tool hold down the alt key (to quickly copy your selection) and drag the square into the other 8 spaces. How does the pattern feel? Is it balanced? Is it fun? 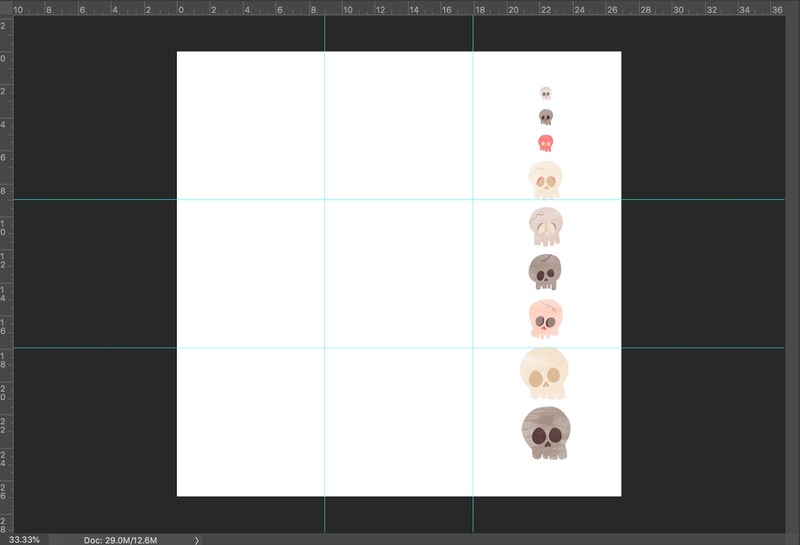 Mine isn't perfect, you can see the largest grey skull repeating in the same position, and then you see the large pale skull does the same... and so on. 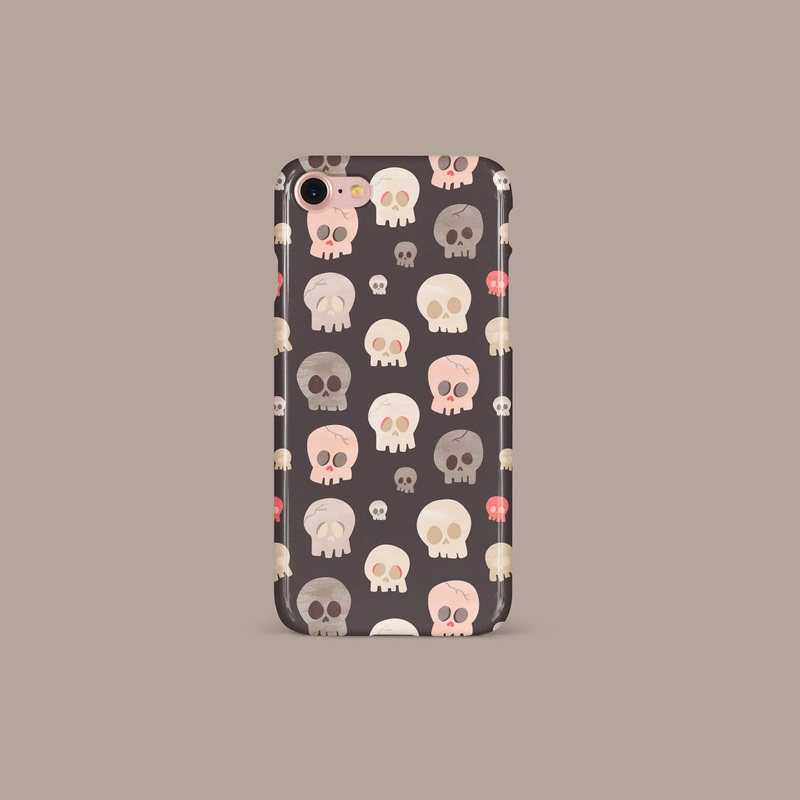 But it's well spaced and doesn't look obvious on a phone case! Patterns that look repeated are pretty too, it just depends what you're going for! Use two or more of the same object within the middle square - this means it repeats in two different positions so it isn't as samey! Scatter the objects, don't have any on the same baseline or you will see that line repeating within the pattern. Play with scale, have multiple sized objects to move the eye around. I think it makes objects more engaging too. Reflect and rotate objects. If you don't want everything falling in the same direction, rotate objects so they lean all over the place. Then once you have the PERFECT puzzle piece, you want to save it. Using the Masking tool, select the middle square again. Then Edit -> Define Pattern. Save with an appropriate name so you can find it again. 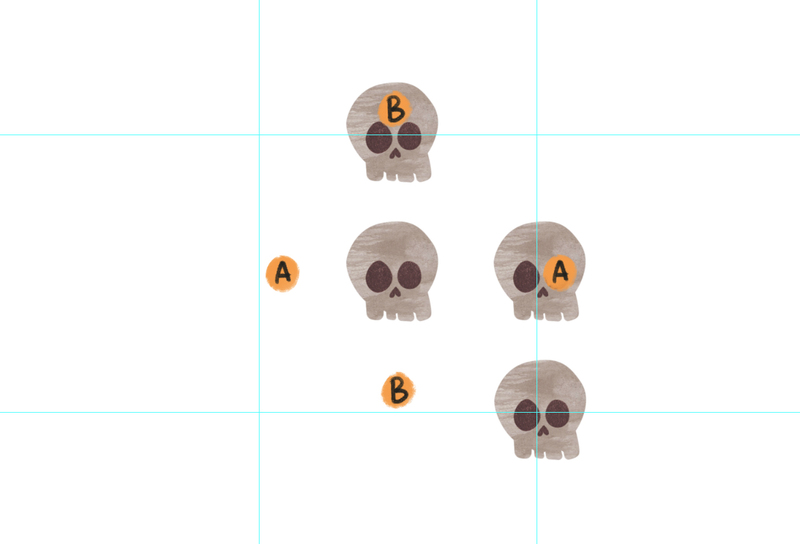 If your objects had no background to begin with, remove the white background layer before defining the pattern. This means you can apply the pattern onto any coloured background rather than white! And now you can put it to use! Open a file ANY size and your pattern will fill it. I'd go for A2 just to check the pattern works large scale. At the bottom of the Layers panel is a half filled circle. When clicked it comes up with filling options. Choose Pattern. You can then fill the area with any of your saved patterns! Play with the scale, but remember on photoshop if you scale over 100% it will become pixilated. If it's not big enough, you need to go back and design to scale for the product you want your pattern on. 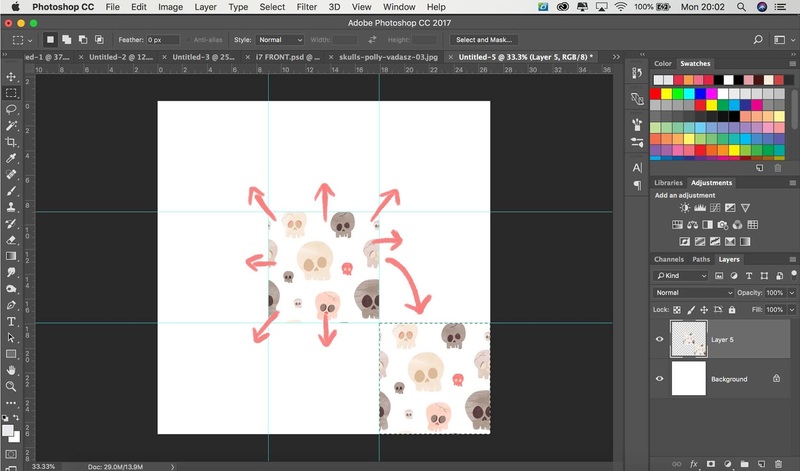 To make sure you don't lose your pattern, save the psd file of you making it so it can be tweaked. 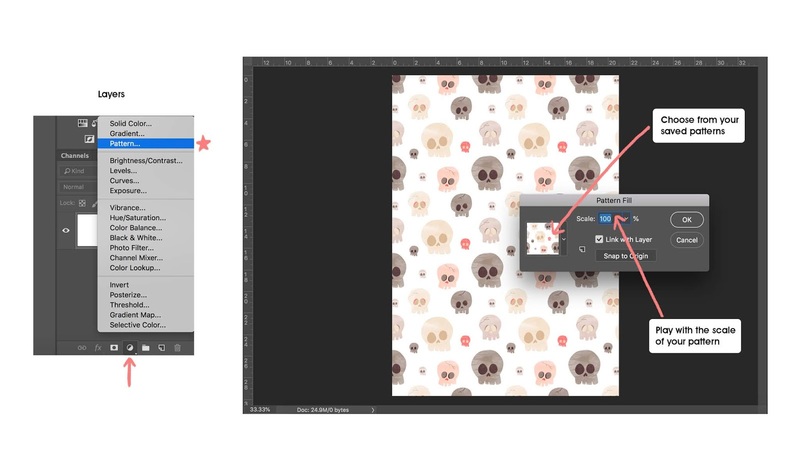 You can also save the pattern to your files by clicking the drop down menu, selecting the pattern, clicking the settings button and saving the pattern. You also load up saved patterns this way! And now (hopefully) you have a lovely repeat to place into any template you want. If you'd like to edit the pattern once it's been applied, right click on the layer -> rasterise it -> right click on the layer mask -> apply the layer mask. 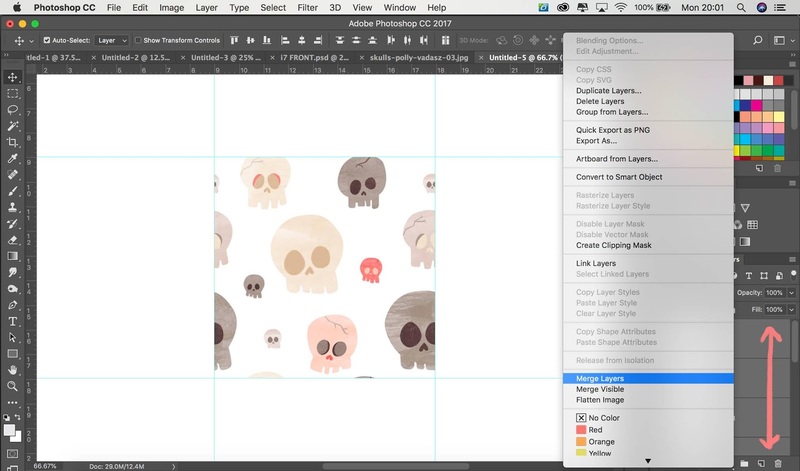 Now you you can move around the pattern for last minute tweaks to make it fit the template perfectly. I hope that tutorial was easy enough to follow? As I mentioned, I'm definitely going to update my Design Tips highlight and blog more tutorials like this, so don't hesitate to request anything you see me doing! I'm new at this but I hope it was helpful & I would love to do more. If you're in a bit of a rut, graduated and already missing learning or self taught and feeling you want to push your work but don't quite know how, I would really recommend Skillshare. I've been a member since my first year at uni when I was really unhappy with my Graphic Design course, thinking I could teach myself illustration techniques in my spare time. It's like Youtube, but full of professional designers sharing their process step by step in a lesson-like structure - they even suggest tasks and homework for you to follow along with! For me it was so valuable to see real designers showing us around their studios and teaching skills they've used to create beautiful work. 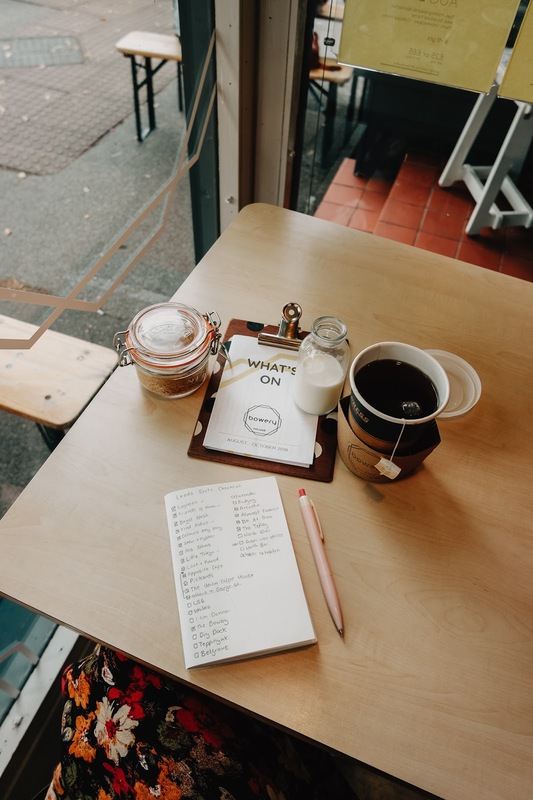 I think engaging with Skillshare lessons would be such a proactive thing for a college student to do to build up their portfolio ready for uni interviews! My link will get you TWO free months (rather than one), so perfect for building up your skills ready for September! :) Signing up will also support me as an Ambassador, which is like, you know, really nice all round. Link: https://skl.sh/pollyvdsz or use code 'igamb1251' while signing up. I'll do another post on my favourite Skillshare videos really soon to give you some ideas - but in the meantime, if you're in the market for some new creative skills, definitely sign up for the trial and have a browse!